On An Overgrown Path: What exactly is a 'classic'? What exactly is a 'classic'? Scholar and poet Mark Van Doren said: 'A classic is a book that remains in print'. So let's assume that a 'classic' music composition is one that receives regular performances. By this definition 'classic' status has been achieved by the Passion settings of Schütz, Haydn, and of course the incomparable St Matthew and St John Passions from the composer 'whose light blots out the feeble rays of other composers.' But which of the modern Passions will be performed regularly, and become 'classics'? The trial has only just begun for Oswaldo Golijov's St Mark's Passion. 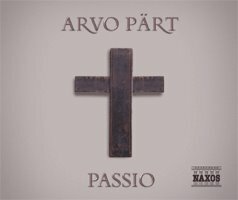 But the verdict on Arvo Pärt's Passio was passed down soon after its 1982 Munich premiere - a contemporary masterpiece that endures today through live performances and recordings. 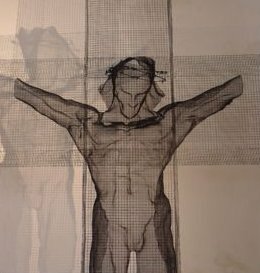 Passio is a setting of St John scored for a quartet of soloists (SA/CtTB) as Evangelist, bass and tenor for Jesus and Pilate, a quartet of instrumentalists (violin, oboe, bassoon and cello), and choir. In it Pärt uses tintinnabuli, with the melody and the accompaniment fused into one. The work is remarkable for its use of silence, with the duration of the silences between the sections determined by the number of syllables in the final word of the preceeding sentence. On Saturday night Norwich's soaring Norman Cathedral was the setting for a performance of Passio. The six immensely demanding solo roles were taken by members of Tonus Peregrinus, the instrumentalists were the principals from Chamber Orchestra Anglia, and the University of East Anglia Choir supplied the chorus and promoted the performance. Howard Williams provided incisive conducting which successfully maintained the balance between the soloists and the unusually large choir. 'Remaining in print' may seem a cruelly commercial criteria for judging a work of art. But Arvo Pärt's masterpiece, which is not yet 25 years old, held the large audience spell-bound in rapt silence for more than an hour, surely proof that Marc van Doren's definition is more than just a criteria for bean-counters? Passio has been recorded several times. If you don't know this work look no further than Tonus Peregrinus' award winning, and very low priced, Naxos version (right) directed by Antony Pitts, and stunningly recorded in the Abbey Church of St Peter and St Paul in Dorchester-on-Thames, here in the UK. The principal roles are taken by Robert Macdonald (Jesus) and Mark Anderson (Pilate) - the same soloists as for the Norwich performance. 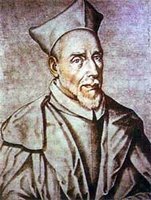 It is excellent news that there are several good recordings of Passio available. But recordings are not the equivalent of books in print. A healthy music scene depends on healthy composers, and healthy composers need royalty income, and that royalty income depends on live performance or broadcasts. Both the costs , and rewards, for making and distributing recordings have fallen sharply in recent years, while the cost of mounting concert performances has risen. This means generating royalties from live performances is more difficult than ever. Malcolm Arnold's (right) Ninth Symphony illustrates this difficulty. This work, dating from 1986, has been recorded by three major labels, Naxos, Chandos and Conifer, and has been described as a 20th century masterpiece. Yet there is not one single live performance, anywhere in the world, in the composer's 85th anniversary year. I do not suggest they are works of equal stature, but it is interesting to reflect that Elgar's First Symphony received more than a hundred performances within twelve months of its premiere in 1908, well before the era of music-like-water. By contrast, in the twenty years since its composition, Arnold's Ninth Symphony has received just three concert performances. Although the difficulty of getting live performances is most acute for contemporary music, it also applies to some surprisingly established masters. The catalogue contains fine recordings of Passion settings by Obrecht, Vittoria, Guerrero (left), Byrd and the grossly under-rated, and elusive, Jacob Handl which are rarely, if ever, heard live today. CDs and MP3s are wonderful things. But the error is to think that they are substitutes for live performance, either artistically or commercially. If you enjoyed this post take An Overgrown Path to Is recorded classical music too cheap? "...the error is to think that they are substitutes for live performance, either artistically or commercially."" Well, I'm not sure. This strikes me as too dogmatic. In many cases, that's exactly what recordings are, like it or not. For sure, they are sometimes the only choice; a noticeable % of recordings I own are of works that I've never had (and never expect to have) the opporunity to hear performed live. Also, I find that I have become more selective in what concerts/recitals I attend, sometimes electing to hear the material on recordings instead. Specifically, my "live attendance" has become more focused on performers as opposed to repertoire. I'm not claiming that this change is a Good Thing (or a Bad Thing either), but it's just reality in my own particular case. I would agree that the experience of a recording (even a "live" recording) is quite different than that of an actual live event. However, to state baldly that it's an error to consider a recording as a substitute for a live performance seems to me to ignore a growing reality. Scott, you make a fair point. That last sentence tried, rather unsuccessfully, to express a very complicated idea in a single sentence. The classical music industry is a very complex system. There are many fixed points including composers, editors, producers, musicians, record companies, concert audiences, CD buyers, and file downloaders. There are several flows within the system including intellectual property, money, and physical product. The relationships and dependancies within the system are not fully researched or understood. This means a major change within the system such as the BBC giving away MP3 files of Beethoven Symphonies, or the decline of live performances, may have profound and irreversible impacts elsewhere, on, for instance, musicians or record producers. Recording as a substitute for live performance may be a growing reality. But because, as I explained in my article, live performances are a vital source of revenue for composers and musicians this change may have major, long term and detrimental effects on the whole classical music industry. The proliferation of recordings and downloads, coupled with the decline in live performances, may be classical music's equivalent to global warming. It may be driven by market forces, but that doesn't make the long term impact any more acceptable. I do not know for certain the impact of the switch from live to recorded performances, or the effect of giving away MP3 files. But I have included statistics in my article to give the discussion some objective basis. What I am saying here, and in other articles On An Overgrown Path, is that the risks should be quantified, understood and debated in advance, and before it is too late. This is superb. Hope you will come to our next concerts too! April 1, 7.30pm, St. Andrew's Hall. UEA Symphony Orchestra (Elgar, Janacek, Schumann & Villa-Lobos). Very interesting, and I think we're in about 99% agreement. "Recording as a substitute for live performance may be a growing reality. But because, as I explained in my article, live performances are a vital source of revenue for composers and musicians this change may have major, long term and detrimental effects on the whole classical music industry." All true. But there's a related aspect that only been touched on. From my narrow view of things, a major reason driving me to recordings vs. concerts is the "museum" view of so much concert programming. Example - none of the "series" tickets for my local symphony are of much interest to me because they have too high a % of pieces and composers which have been done nearly to death. I'm not suggesting that Mozart, Beethoven, and Tchaikovsky are not "great composers," but enough is enough. And when "big name" performers come through, they seldom do anything remotely adventurous. I suggest that one area in which recordings have it all over the general live performance menu is in fresh and unhackneyed repertoire. I'm sure that there are cities with an adequate menu of fresh live events, but they're few and far between. 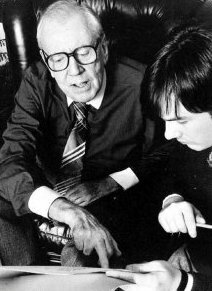 I am Spanish, and here in Spain is very difficult to listen to Malcolm Arnold's music. This year the London Symphony Orchestra is visiting my town, San Sebastian, but it has lost an excellent opportunity to give the Spanish public to know Arnold's interesting and wonderfull music. It's going to play works by Rimsky-Korsakov, Chaikovsy and Brahms. Excellent works, but no English music, no brave program. Congratulations for your excellent blog, Pliable! For my money, Wolfgang Rihm's contribution is by far the best of the set.